More than a nightmare. Now. Not my baby girl. She's just turned 17. We took photos of her and her twins opening their L plates. Now we sit in the emergency dr at almost midnight as she struggles to swallow. That frown. Oh I remember those painful swallows which accompany the frown from the times I was a child laid up. Around 5 times a year I missed school with tonsillitis. Of course they bashed up my intestines with copious amounts of antibiotics. My crohns did not like that much. Her heart beats in the side of her neck. Visibly. She's hot. Then gets goosebumps on her face. Taking her pulse through her wrist I can feel it's way too fast. Blood pressure machine on. Low BP heart rate 149 BMP. Too fast for me to get comfortable with. The iPhone Flashlight illuminates a swollen throat. No gaps. No spaces. Just white stuff. Awake for much of the night last night I began to research my studies. The stuff I am missing during my university absence. Health issues all around me, I do begin to wonder what my future career will hold. Taking care of my family is my number one priority, which goes without saying. Yet how can I juggle everything else that goes along with my busy, busy life. Do I enjoy the chaos of doing too much? Probably. To the detriment of my health? Maybe. Something I know is I want to make a difference. Make people feel better. Including myself. We all deserve this life of feeling better, being well, being happy; smiling. That night at the emergency doctors we were blessed. An amazing GP who cared, praised my daughter for being brave, recognising how ill she is and also taking this illness so seriously she felt my girl needed the hospital. 39.9 degrees temperature. Racing heart. She needed medication and now. Which is exactly what the Dr did. 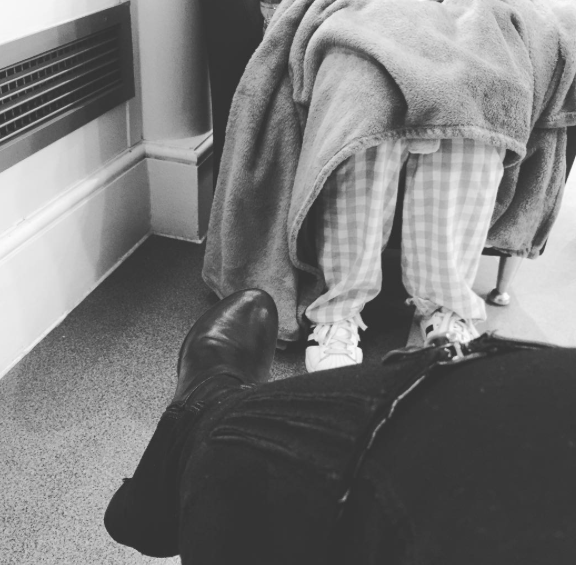 As we waited in the waiting room for 15 minutes to see if 1. her temperature dropped and 2. if she reacted enough to not need the hospital, I thought back to writing this blog. How I adore writing this blog. Wishing I could be more creative, I think on to time. The family needing me, the stack of university work backing up. How do I write my essay when Jeremy Kyle plays on in the background and Mum gives me a running commentary? Oh if only I was that person in my 20s who was a night owl. These days I can't get much past 11pm before my eyes simply close all by themselves with no command from the brain it seems. Instead here I sit at 5am on Saturday morning typing quietly from my new bed, the sofa, brain dumping conscientiously enough to hope someone can relate to my muse. A mother perhaps? A Carer? Someone else who has an illness and is trying to be a carer? My heart goes out to you all. Our struggles are the things that make us proud every once in a while, pat ourselves on the back and feel like we are making a difference in life. Even something so simple as making a sandwich can put a smile on someones face. So here I am wondering about my future. I never envisaged I would be a full time carer. Yet loving people is my strength. Will I be that full time carer? Will I be the person who helps others with their health online? Would the girl I used to be want this or would she want the status of having a job description? Life still leaves me wondering at this age. As a child, you think grown ups know everything. Yet the twists, turns and meandering of life events means we can't possibly know everything. So, one step at a time we flow downstream, taking on the challenges that meet us along the way. Just for today, i will take one step at a time.